Nominations are due by our annual Winter meeting. A candidate is a person who has made significant contributions to NABO and/or who have given extraordinary commitment to Basque culture in the United States; i.e., they have contributed beyond their own local Basque community (because NABO's role is not to interject itself in local affairs where each community has the right and privilege to acknowledge its own extraordinary members). Please describe the volunteerism and actions of the nominee which have promoted NABO related activities to promote Basque culture and identity in the United States. Explain why this person deserves this recognition. 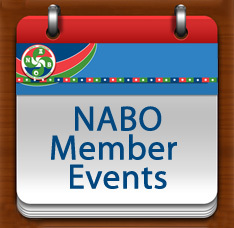 Nominees should be submitted to the NABO secretary before the winter meeting of each year. Please copy and past this into an email message and send your nomination via email secretary@nabasque.eus . Jerry Etcheverry has been a staple in both the Winnemucca Basque Club as well as NABO. As a festival chair, member of the board of directors, and mus player, he has tirelessly worked to perpetuate Basque culture in Nevada and beyond. 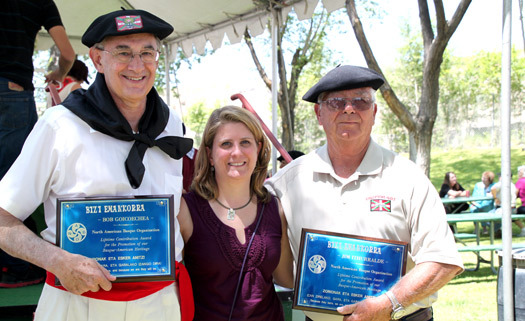 Through his many years as NABO delegate, he has represented Winnemucca Basques and collaborated with many other clubs through NABO to preserve and promote Basque culture for future generations. Leadership Role: Valerie Arrechea served as NABO's president for 8 terms from 2009 to 2017 and has served as a NABO delegate since 1991. Valerie represented the U.S. and NABO at the 5th and 6th World Congress of Basque Communities in The Basque Country. Valerie has served as the NABO Udaleku chairperson and co-chairperson since 1992 and has been an Udaleku instructor nine times and has organized the Udaleku camp in San Francisco seven times. Valerie has organized various dance and txistu workshops throughout the years. In 1993 Valerie organized a dance group made up dancers from several NABO clubs to perform at the Semana Vasca at Mar del Plata, Argentina (Iparaize). Basque Club of San Francisco: Past President, longtime NABO delegate since 1991, long time secretary and current and longtime dance director of both the Zazpiak Bat Dancers (since 1989) and the Gazteak Dancers (since 1987). Txistu instructor since 1991. Recipient of the Basque Club's Claude Berhouet Lagun Ona award for lifetime contributions. Valerie is the Basque Club's mus organizer for their annual NABO mus tournament. San Francisco Basque Cultural Center: Past President and longtime secretary. Valerie is a key member of the board of directors and serves on many of the important committees such as the Entertainment Committee, Building and Grounds and including incorporating dance, mus, pilota and Euskara in youth activities. Valerie is the Basque Cultural Center's mus organizer for their annual NABO mus tournament. The Basque Program was an hour-long radio show every Sunday out of Buffalo, Wyoming. Its opening line, “One hour of music, news, messages, and views sponsored by, and for, Basque people of the area,” said it all. Over the 40 years of the program 1957 – 1997 several Basques would help Jeanette Esponda Maxwell, station owner, commentate on the program. The only surviving commentator is Rosita Maya, who still resides in Buffalo. The program relied on the donations from local Basques to keep it going, as well as the generosity of Jeanette herself, and her commitment to keeping the program on the air. Jeanette referred to KBBS as Buffalo Basque Station Beyond keeping everyone informed about local news, the program served to perpetuate the Basque language in Buffalo and the surrounding area. It was originally designed to ease the isolation felt by the sheepherders. Daughter of John Esponda, an early Basuqe pioneer who settled in the Buffalo, Wyoming area, Jeanette was the originator and hostess of the Basque Program on KBBS radio station. Through it she helped Johnson County, Wyoming Basques remain a vibrant and cohesive community. Jean is a self-taught musician who has worked to perpetuate Basque music and dance in the United States since the age of 16. After providing music for the Utah’ko Triskalariak dancers, he put together a band locally that would play at Basque events across the country. Jean was instrumental in getting the Buffalo Basque Dance group off the ground. He continued to support the buffalo Basque 10 club by attending and providing entertainment at their annual picnic. Today, Jean is mentoring a new generation of Basque musicians carrying on the tradition of the great icons in Basque music, Jimmy Jausoro, Bernardo Yanci, Jean Iribarne, and the like. Long time NABO delegates from Buffalo. They have been active in their club and always supported NABO activities. Nancy served as NABO Secretary under Mary Gaztambide from 2004 – 2009. She was very involved in her local Basque Club in Salt Lake City, also serving as secretary there from the late 80’s until about 1992. She was a dedicated dance mom and followed the Utah’ko Triskalariak dancers on their travels performing at various venues. Izaskun was nominated for the award for her work as the first NABO Euskera Coordinator, her dedication to the preservation of the Basque language in the US, and willingness to help anyone and everyone she could. Izaskun not only taught face-to-face classes in Boise but was also willing to adopt any other individuals who wanted to learn on-line but who didn't have a club to rely on. She also created curriculum for teachers in other clubs as well as worked closely with HABE and Euskera Chair Martin Goicochea to ensure that the NABO Euskera program continued to run smoothly. Joseba is very well-known to most thanks to his extensive travel through Basque America. Joseba has not only contributed to NABO by serving as a Euskera/song teacher at numerous Udalekus, but he has also collaborated with many clubs who have hosted NABO conventions working to bring entertainment from the Basque Country, as well as sponsorship in some cases. His main contribution, however, is his website EuskalKultura.com that is dedicated to the dissemination of news by and for the Basques in the Diaspora. 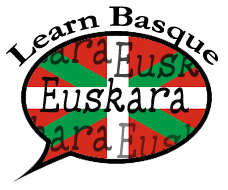 His daily bulletin covers news from Basque clubs worldwide in three languages. His tireless work allows us to follow events from the US to Shanghai and back again. John has a very long career in NABO beginning with Udaleku and chairing various committees. He is probably better-known for serving as NABO's facilitator for many many years. In that role, John created the website and numerous initiatives from language maintenance, "Got Basque?" to youth involvement, to maintaining the tradition of Basque mass at festivals. John also has collaborated with numerous clubs serving as festival MC in many communities, or teaching dance workshops. John is always willing to serve wherever needed. Benan, a technician for the Basque Government's Directorate of the Basque Communities Abroad was nominated for his ongoing support and efforts in favor of the US Basque community. In a time where Basques in the US were maybe over looked due to their lack of political participation in Euskadi, Benan stood fast and supported NABO and its initiatives ensuring that funds would be equally distributed to all, and not just to countries with voting Diasporas. Benan also took his job a step further in creating personal relationships with many individuals in many clubs. Always willing to help with grants, or collaborating in any way possible, Benan is always just a call or email away. Martin has always been very involved with the Kern County Basque Club. For those of you who attend the Bakersfield Basque Festival, you know him well, as he is the Master of Ceremonies for the afternoon dance performances. During the performances you may remember some of this Cowboy Sheepman's infamous lines such as, "I wish I was 20 again. Look at my little yearlings. Give them a big hand, they sure deserve it. Look how bright our future is." He also served for many years on the Basque Club Board of Directors. Martin's background and love for music led him to host NABO's annual Kantaria Eguna. He is the Master of Ceremonies at this NABO yearly event and you can be assured Martin will always provide beautiful songs for everyone to enjoy. Aita Jean-Michel Lastiri has been celebrating mass at Basque Festivals since the passing of Aita Martxel Tillous in 2009. Aita Jean-Michel is currently the pastor at the Immaculate Heart of Mary in Hanford, CA. (http://www.ihmhanford.org/pastor) His parents were Anastasio Lastiri from Arizkun, Nafarroa and Marie Carriquiry from Baigorri, Baxenabarre. Aita Jean-Michel was born in Pomona, CA, but raised in Hanford, CA, outside of Fresno, where his father owned and operated a dairy in Hanford. He graduated from CSU Fresno in 1978, and from the Pontifical College Josephinum in 1983 in Columbus, OH (seminary). Aita Jean-Michel also earned a Masters in Catholic Bioethics from St. Louis University, St. Louis, MO and completed Graduate Studies work at the Pontifical North American College in Rome, Italy. He was ordained priest at St. John's Cathedral in Fresno on April 27, 1985. Frank Maitia was one of the founding fathers of the Kern County Basque Club in 1944. He was both an officer and a director for many years. He also was instrumental in the building of the Kern County Basque Club's fronton. The new fronton breathed new life in to our club which re-established our collaboration with NABO. Frank's love for his Basque culture extended beyond the Kern County Basque Club. He was a pioneer in the Bakersfield Basque restaurant scene but his Basque pride continued to extend beyond Kern County. Frank Maitia was the Kern County Basque Club's first NABO delegate in 1973. He served as the NABO President in 1978 and as the Vice-President in 1979. In the 1970's Frank would host the French handball players every two years for NABO and usually used money out of his own pocket to entertain them. Frank loved to share his Basque heritage with all of his friends and family. He would bring musicians and weight lifters from the Basque Country and invite everyone to the restaurant to enjoy the entertainment. We are grateful for his perseverance which helped to pave the way for the Kern County Basque Club. as NABO's Calendar Coordinator for many years and wrote many grant requests on behalf of NABO. Through a NABO grant of the Basque Government (1994), Martin worked with Carmelo Urza of the Center for Basque Studies to create a book of a collections of articles entitled "Historia de la Pelota Vasca en Las Americas." Minaberry was one of the founders of the "Confederación Panamericana de Pelota Vasca" and he was president at this same organization when he proposed the idea to the Basque Government and started working on this book project. Basque Club of San Francisco: President 1981-1982, VP 1980-1981, Secretary 1979-1980, 1982-1986, Director 1979-1986. Elgarrekin Basque Choir – 1979-1991. Basque Educational Organization: Founding Chairman 1984, Chairman 1984-1991. United States Federation of Pelota: Founder (1982), Secretary for many years. San Francisco Basque Cultural Center: Founding member 1981. On November 7th, 2009, Martin Minaberry was honored by the Basque Educational Organization and the San Francisco Basque Cultural Center by having the Basque Library that he started in 1984 be rededicated in his name, The Martin Minaberry Library. The name Marilou at the Kern County Basque Club is synonymous with laughter, hard work, and attention to detail. Marilou served as a director for the Bakersfield Basque Club Board for 14 years, specifically as secretary for 10 years. Even before her serving on the Basque Club Board, she assisted in planning the 1994 NABO Convention in Bakersfield. During her tenure on the Kern County Basque Club Board she was instrumental in organizing the 2004 NABO Convention in Bakersfield. She has also served as a NABO delegate for the Kern County Basque Club as well as coordinator of the NABO Mus tournaments in Bakersfield. Mus players can always count on a big smile and a warm welcome from Marilou when they participate in our tournaments. In 1989 she assisted with the Bakersfield Udaleku Music Camp and orchestrated the 1997 and 2005 music camps hosted in Bakersfield. Those of you who know Marilou are aware of her motto-Together Everyone Accomplishes More (TEAM). Marilou's 'can do attitude' inspired other members to volunteer and work together to make our Basque culture and club come alive for all ages. Jim was born in Ely, Nevada to Basque immigrants Manes and Mary Jean (Goyhenetche) Ithurralde. He was raised on a sheep ranch in White Pine County and graduated from Eureka County High School in 1960 and furthered his education at Link's School of Business in Boise. He returned to his home town of Eureka and went into banking and was later transferred to Elko were he and his wife Monique became involved in the Elko Euzkaldunak Club. His wife had come to this country as a small child from Eskul Herrria. Both of them held several officer positions in the Elko Club. Jim and Bob Goicoechea were elected to be the first delegates from Elko to help form the North American Basque Organization (N.A.B.O.) This was challenging times to start this federation bringing the French Basque and the Spanish Basque to unite as one. Jim was used to this because as president of the Elko club he had had some of the same issues. After several meetings were held and at the end they took to heart the Basque motto Zazpiak-Bat and became unified to start this great organization. At that time Jim was still a banker and he became N.A.B.O. 's first treasurer and its second president. Jim is better known as an announcer of Basque festivals throughout the State of Nevada for over 40 years.. He started announcing the National Basque Festival of his home club Elko in 1970. He has announced in Ely, Reno and Winnemucca. He announced the Winnemucca Festival for 28 consecutive years. He enjoyed explaining the Basque culture and heritage to people attending these festivals. In 2004 Jim and his brother Bob put on a program about the Basque at the USA/Canada Lions Club Leadership Forum. Jim's original vision of what N.A.B.O should be has become a reality to him of unifying the Basque communities of North America and teaching our children why they are Basque and to be proud of their heritage and culture. He was very surprised and pleased that his peers honored awarding him the Biza Emankorra Award at the 2013 at the Elko National Basque Festival. Anita Anacabe is the owner-operator of the Nevada icon, Elko General Merchandise, AKA Anacabe's. Since the age of 4 she has been involved with the Elko Basque community educating people about anything Basque. She is a Business Education graduate of Boise State University and a member of the original UNR-BSU program abroad. The Onate program was a predecessor to the USAC Consortium. After being adjunct faculty in Spanish and Basque at Great Basin College, Anita continues to teach Euskara through the Elko Euzkaldunak Club. She has taken hundreds people to the Basque Country on various educational tours. She has represented Elko in the North American Basque Organization for many years and is a recipient of the Bizi Emankorra award. She was included in the Nevada Legacy Project – 150 Years of Excellence. Anita and Mike Franzoia have four children that all espouse being Basque also. Isidro has been an active member of the Winnemucca Basque club since 1975. He has acted as Festival Chairman/Co-Chairman for well over 8 years and has held the office of President or Vice President of the Winnemucca Basque club for 12 years. He also represented the Winnemucca Basque club as NABO delegate for 17 years. Isidro has donated many hours and days of his time to promote the Basque culture in his lifetime. He has been a major influence to our Basque club and to NABO through the years, whether it be through organizing NABO Conventions here in Winnemucca or encouraging the youth of the community to take active roles in NABO. At this time in his life he enjoys watching is Grandchildren dance and playing Mus with his daughter. Martin Goicoechea spearheaded NABO's Euskara recovery and preservation program back in 2000 and continues to serve as NABO's Euskara Chairperson. Through this committee, lead by Martin, many euskara classes started up throughout the NABO member clubs and euskara preservation has become one of NABO's prime objectives. He has worked closely with the Basque Government and with HABE to negotiate the free use of euskara learning tools such as Hezinet and BOGA, and has worked to get special grants to staff a NABO euskara coordinator. All of these efforts by Martin and NABO were recognized in 2009 by Eusko Ikaskuntza when NABO was awarded their Euskararen Nazioarteko Eguna prize for the promotion of Euskara. Along with Martin's commitment to NABO, Martin is also very active in his local club in Rock Springs, Wyoming and was one of the main organizers of the 2005 NABO Convention in Rock Springs. Martin has been a longtime supporter and participant in NABO's Kantari Eguna event. Martin is one of only four active bertsolaris in the United States and often performs for many of the NABO clubs at their events from New York City to San Francisco. In 2003, Martin received the United State's highest honor in folk and traditional art when he was awarded the National Endowment for the Arts' National Heritage Fellowship in Washington D.C. In 2005 Martin was inducted into the Society of Basque Studies in America's Basque Hall of Fame. In 2003, Marin was a member of the NABO delegation to the Basque Government's World Congress of Basque Communities. Kate Camino has been very active in NABO events for many years. She has served several times as an Udaleku Director: 2000 (Buffalo), 2002 (Reno), 2008 (Buffalo), 2010 (Reno) and is now the Udaleku co-chairperson. She is longtime NABO delegate since 1991 (Center for Basque Studies, Buffalo). 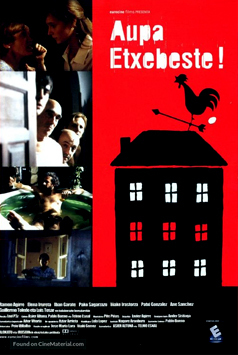 At the international level whe was chosen to represent NABO at the Second World Congress of Basque Communities held in Gasteiz, Araba, October 1999, then chosen to participate in Gaztemundu 2002 special Dance edition by the Basque Government, honored by the Basque Parliament (Eusko Legebiltzara) for organization of "Renoko Aste Nagusia" July 1999. She was also appointed by Euskal Irratia Telebista (EITB – Basque Radio and Television) as their North American correspondent, 2000-2006. At the local level she has served as director, president and secretary for the Zazpiak Bat Basque Club (Reno), past director for the Big Horn Basque Club (Buffalo), dance instructor for the Zazpiak Bat Basque Club (Reno). Victor was one of the original five Basques to organize the Fresno Basque Club in 1978 and became one of its first NABO Delegates in 1979; and he served us well for 22 years. He was also our Club's first MUS chairman; and he ran a "tight ship" regarding the rules of the game, implementing the use of score cards on each players' table which later was utilized by other clubs. In 2004, he was a recipient of the 24th ANNUAL HALL OF FAME award by the Society of Basque Studies in America. He was honored for his NABO-oriented qualities as well, when in 2000 he was appointed NABO MUS Chairperson. For over twenty years he also assisted Pierre Etcharren and Jean Baptise Aguerre organize tournaments. Up until 2004, he had been involved in 25 national tournaments and 10 international tournaments. Although no longer a NABO Delegate since 2001, he still keeps track of the majority of clubs' winners and especially keeps up-to-date records of all national NABO winners! He literally has an ARCHIVE of notebooks on NABO championships and is SO PASSIONATE about the game and its players! The Society honored Victor for his steady, optimistic and determined dedication to mus games, Basque traditions and sports. Because we know Victor immensely enjoyed being involved in NABO for so many years, both as Delegate and involved with the mus games, national or mundial, we are submitting with honor and pleasure his name as a nominee for the NABO BIZI EMANKORRA for 20ll. Many of the younger Delegates may not have met Victor, but we are sure they would respect him for his dedication of many years to NABO. We know he did it with a glad heart and Basque pride, and it gave him great joy! Emilia Sarriugarte Doyaga was born and raised in Brooklyn, New York. She received her Bachelor's Degree at Hunter College her Masters at Columbia University, and her Ph.D. at New York University and the Institute of Educational Management at Harvard. She was a professor at St. John's University, Brooklyn College and York College of City University College of New York, and a Distinguished Professor of State University of New York. She served as Dean at York College of New York and as Academic Vice President at State University of New York. She has published books on Unamuno, Becquer, and the Spanish Language as well authored articles related to the Basques on Columbus, Cuba and the New York Basque Center. Dr. Doyaga is currently the President and NABO representative of the Society of Basque Studies in America, an organization she founded with two other academics. She has volunteered as the NABO Delegate for more than a decade, traveling and crossing the United States to the NABO meetings which have always been held in the west. The extra effort, time and money dedicated to NABO from the eastern Basques are noteworthy. She has often been the sole voice for eastern Basques as well as those in Florida. She maintains contact with Basques from all NABO clubs and has traveled to visit more than half of the clubs over the years. Emilia danced with the Basque dancing groups of New York for years as a young adult and traveled Canada, the United States and Cuba with a professional group of Basque dancers. Emilia created the Basque Hall of Fame, having served as an organizer and has traveled to be present and be the moderator at every single Basque Hall of Fame induction ceremony (29 total). She has been selected by the Basque Government to attend the World Congress of Basque Collectivities in 1995 and 1999, and the American Congress of Basque Centers in 1997 in Buenos Aires. With José Ramon Cengotitabengoa and Anna Aguirre, Emilia has maintained the Society of Basque Studies in America and its relations with euskal etxeak around the world, always promoting NABO activities, its calendar, its delegates and its mission. No one knows Emilia's physical age, we know her activity and promotion of all things Basque to be limitless. Emilia has volunteered in leadership positions at the Euzko-Etxea of New York, the Society of Basque Studies in America, and is the initiator of the Basque International Cultural Center in New York. She is constantly volunteering for projects related to promoting awareness about the Basques such as the NABO initiative to correct the New York Times' erroneous reporting on Euskara. Emilia was the liaison who took hundreds of signatures to an assistant editor to ask for a correction. She was a leader for the Trainera Project which built and donated to the Basque Country from the Basque diaspora an authentic trainera. With the Society of Basques in America she was instrumental in helping execute the Basque Sheepherders' Monument in Reno. She has endlessly promoted Basque art and artists in the United States, as well as Basque cuisine on the US east coast. She has promoted Euskara in her own club and is constantly encouraging others to take the courses. In 1976, NABO was interested in forming a Pilota Committee to promote pilota throughout the western United States and encourage interaction between Basque Clubs that had frontons. As he was already the Pilota Chairperson of the San Francisco Basque Club, Franxoa was invited to one of their meetings. At that meeting Franxoa was appointed Chairperson and asked to form a Pilota Committee. Immediately after the meeting, Franxoa contacted Basque Clubs which had frontons and formed the Pilota Committee with the pilota chairmen of the various clubs. In addition to attending regular NABO meetings, he would meet several times a year with the Committee members at various locations to discuss how to promote pilota, by teaching the youth and encouraging club tournaments. The first NABO Pilota Tournament was held within one year of the committee formation. Contacting the Federation Francaise de Pelote Basque (French Federation), the committee was able to set up competitions between their players and NABO players, taking place every 2 years. This continued for more than 25 years. He was instrumental in encouraging the reopening of the Boise Fronton at the Basque Block which had been used as a warehouse for many years. Franxoa had a vision for the United States to participate in the International Pilota Tournament. In 1978, he was the coach for the NABO sponsored team to the world tournament in Biarritz. This led to the formation of the United States Federation of Pilota in 1979. Franxoa has been on the Board of Directors from its inception until today and was president for four years. Franxoa has been very active in the local Basque community in San Francisco, and was inducted into the Basque Hall of Fame on November 11, 2006. Franxoa is still very active in the San Francisco Basque community and is currently a member of the Urazandi Committee. Josephine Mainvil Arriet was born in San Bernardino, California. Her father, Jean Mainvil, came from Hasparren, Labourd and her mother, Frances Oses, from Errazu, Navarre. They had two children: Josephine and John. Josephine attended Chaffey College in Ontario, California and, even though times were bad during the depression years, her abilities were recognized, and the Chaffey schools employed her in the Attendance and Business Offices for 14 ½ years until she married John Arriet, a farmer, who raised cotton and alfalfa. The couple moved to Fresno, California where their daughter, Kathy, was born. Kathy had three sons and Josephine is proud of the grandsons: Brett, Phillip and Jonathan. Josephine's interest in Basque culture started very early when her parents took her to visit Basque friends and to attend Basque festivals. Her daughter learned Basque dances at Los Banos Basque Club and, when Fresno Basque Club opened, Josephine became a dedicated working member. Victor Esain, who was president of the club, appointed her as a delegate to her first NABO meeting in 1982 where, ever since, her steadfast presence has been noted. She has been an active member of the California and Local Woolgrowers Auxiliaries since 1960 and has been in charge of raising money for the promotion of lamb and wool for 15 years. Francois Pedeflous has not only been an active member in NABO but also in the Los Banos, Fresno and KCBC Basque Clubs. He had always been a strong supporter in pelota, generously donated many hours of hard work in promoting the sport as well as monetary donations. While being the NABO Pelota Chairman, Francois Pedeflous was very instrumental in the formation of the United States Federation of Pelota which was established on March 20, 1982 in Miami, Florida. Proud of his Basque heritage, Frank spent most of his adult life promoting and preserving Basque culture. He served in various leadership positions in the Los Banos and Frenso Basque Clubs, and as NABO President from 1981--83. He was also instrumental in keeping pilota (Basque handball) going, serving in various capacities on the national and international levels. Frank was well known for his dedication to his family and friends, his drive and courage in business, his love of food and wine, his black beret, and his passion for baseball! As a new immigrant to the United States, he learned to read and write English by reading Boxing Ring Magazine, and he proudly became a US citizen in 1955. He also enjoyed hunting, playing Mus and visiting friends and relatives throughout the Basque-American community and Euskal Herria. Jean-Leon Iribarren attended the first organizational meeting held to establish what we now call NABO. He was a delegate to NABO from the San Francisco Basque Club for several years, and then served as NABO President 1987-90; previous to that he served as NABO's treasurer 1Tr983-87. In 1967-1968, he served as president of San Francisco Basque Club, and 1974-80, 1983-87, was treasurer. In 1978, he was key in organizing the 1978 NABO convention, which also hosted San Francisco's first international mus card game tournament. Around this time, he also helped organize the first Basque Music summer camp, still popular to this day as Udaleku. In the SF Basque Club's earlier years, he was amongst those who were involved in the early land acquisition in the south bay, which was planned as the site for future Basque picnics which had grown in popularity. Despite his ambitions, it's failed attempted, provided the spark for the creation of a local Euskal Etxea. In the early 1980s, he was part of an entrepreneurial few who recruited participants in the private financing of what is the San Francisco Basque Cultural Center. NABO was in full swing, and its vision attracted much of his efforts. Between 1983 and 1987 he served as treasurer, and 1987-90 as president. He remained active in all of these organizations until his untimely death in 1993. Jean-Leon Iribarren was an exceptional man who always responded to requests for help from individuals and organizations. He will be remembered as a leader, educator, motivator, and mediator who influenced many of his peers. The success of these Basque organizations is a great memory to his legacy. His vision for NABO was widespread. He saw NABO as the necessary vehicle to unify small and large Basque clubs so that together they could promote Basque culture. Jacques was the 3rd president of NABO, and during his term he attended as many Basque club functions throughout the western US as possible. At these functions, he would promote NABO and educate members and clubs as to what NABO was about and what its role and significance was in relation to the promotion of Basque culture. He felt that NABO was a tool for future Basque generations, from nationwide locations, to enable each other to interact together at activities and functions that NABO would sponsor. During these formative years of NABO getting Basque clubs to join was a serious challenge. During his term as president NABO initiated popular events, such as the NABO pilota tournament, that enticed clubs to join NABO. With his persistence and going beyond the call of duties of president, NABO's club membership nearly tripled during Jacques' tenure as NABO president. His vision strongly impacted Basque culture in the US and enabled NABO to grow in membership. In 1978 NABO sponsored a pilota team, which competed in the world tournament in Biarritz. With Jacques' assistance this led to the formation of the United States Federation of Pilota, for whom Jacques served as inaugural president. He returned to Euskal Herria in 1984 and started a farming business. This gave him the opportunity to enjoy his first love – the euskal herriko mendiak (Pyrenees mountains). Jacques passed away in 2002 in a farming accident in the Basque Country. He is survived by his wife Dorothy and his three children, Marc, Daniel and Jacqueline. Grace was born in San Juan Capistrano, California in 1934. She is the daughter of Basque immigrants who settled in California. Her father, Jean Pierre Lacouague, arrived in San Juan Capistrano, California from Ainhoa, Lapurdi in 1910. Her mother, Bonifacia Mujica, came to Fullerton, California in 1912 from Maya in the Baztan Valley of Nafarroa. Grace spent her early years on her parent's ranch where she grew up with traditional Basque life and culture. After marrying John Mainvil in 1959, they settled in Riverside, Califormia. Where they were involved in the Southern Californian Basque community of Chino. In 1972, they moved with their four daughters to Weiser, Idaho. After retirement, they moved in 2002 to Eagle, Idaho where they currently reside. She was selected to be Ontario's N.A.B.O. delegate in 1982. Because of her desire and passion to contribute to Basque culture, she has represented Ontario at N.A.B.O. for over 20 years. Through the enthusiastic and detailed N.A.B.O. reports that Grace gives at the Ontario meetings, it is evident that she truly believes in and is dedicated to the mission of N.A.B.O.. In 1987 Grace was elected to the office of N.A.B.O. Treasurer, a position of great responsibility that she has retained for many years. Always looking out for the best interests of our federation, Grace has done a thorough and impeccable job in this office. She pursues with equal vigor matters of cents and those of thousands of dollars. Her professional attitude and detailed treasurer's reports reflect her dedication to our organization. For eighteen years Grace has provided continuity at the head table at N.A.B.O. meetings. Over the years many presidents have come and gone while Grace has quietly served as our trusty anchor. She has become an invaluable resource for all of us regarding our collective past. In 2003, Grace was chosen to represent N.A.B.O. at the Third World Congress on Basque Communities held in Gasteiz, Araba. She was an ideal ambassador for our federation because of her in-depth knowledge of N.A.B.O., her interest in Basque culture worldwide, and her friendly manner and ease of communication with other participants. Her life-long passion to be involved in and promote Basque culture in communities surrounding her makes her a strong candidate for this honor. Above all, however, we felt that Grace deserves this award because she truly embodies the ideals of N.A.B.O.. In her quiet way, Grace has played an indispensable role in helping N.A.B.O. fulfill its mission. She has done this directly by serving as treasurer for nearly two decades and indirectly through her work for Ontario, Oregon Basque Club, representing our views at the N.A.B.O. level. She is committed to the success of N.A.B.O. and works with all member clubs whenever they need assistance. Pierre was one of the founding members of both the San Francisco Basque Club and Basque Cultural center. Because of his experience with Basque dance in Euskal Herria, he instructed and directed the San Francisco dance groups for over 25 years. His passion in this area moved him to start Udaleku (formerly know as Music Camp). The first Udaleku took place in three phases, hosted in Boise, Reno and San Francisco. Pierre worked to bring the first dance and txistu teachers – Jon Onatibia, from Oyarzun, and Luis Manuel Mentxaka. He has also helped organize this event the numerous times it has be hosted in San Francisco. He still believes that Udaleku is one of NABO's finest accomplishments, and works to keep its high standards. Pierre was the founder of the International Mus Tournament of the world's Basque communities. In 1978 he traveled with the NABO Mus winners to the Basque Country, where he had made connections and had arranged to have them participate in an existing regional tournament held in Ascain between France and San Sebastian. Under his vision, he took this small tournament and in 1979 in San Francisco transformed it into a truly international championship with participation of 7 countries. This tournament has been held every year since then, and includes participation of all the world Basque communities. In 2003 he was chosen as the recipient of the Mus Lifetime Achievement Award from the Basque Mus Communities in Argentina. The award itself was presented to him in Acapulco, Mexico in 2004 by Manuelo Arriola of Argentina. Pierre felt it was important that NABO member clubs participate in some fashion, either with dance group, klika, pelotari, wood chopping, or singing, at the annual conventions. With Pierre as Chairman, and the help of the San Francisco Basque Club, the 1979 convention in San Francisco was a realization of this dream. It was the first time all NABO dance groups and klikas were present. Also present at the convention was Udaleku and the first International Mus Tournament. Pierre served as NABO President from 2000-2004, and represented NABO at the 2000 Semana Vasca in Necochea, Argentina and gave a presentation on the NABO Udaleku program. In 2002 he was invited to Vitoria-Gasteiz, Araba by President Ibarretxe to give a report on NABO's cultural activities. He took that opportunity to convince the Basque Government to change the dates of the Gaztemundu program and 2003 World Congress of Basque Collectives to July so that there could be greater participation by NABO members. By invitation of President Ibarretxe, he attended the 2003 World Congress. His persistence and countless volunteer hours have helped NABO become the well respected organization that it is today. N. A. B. O. He knew no stranger; he crossed all dialectal and provincial borders to make everyone welcome in his realm. Just his warmth and strong handshake made you feel apart of his world. He blended the ecclesiastical with being Basque well. He was never too heavy on either. There isn't a Basque in the western US that has contacts in Euskal Herria that Father doesn't know. Whether you are in the U. S. or in E. H. with a couple of phone calls by Father can locate someone here or there. There wasn't a N. A. B. O. convention that you didn't see Father and even after his 10+ years stay here he brought groups from E. H. to N. A. B. O. functions. He also helps people and groups while they are in E. H. He helped the Spring Creek Nevada Band and Choir back in the year 2000 put on performances in Bayonne that were well received. He was there for the Boise Biotzetik Choir when they needed him too. Remember a wedding, baptism, funeral, festival or other function he was at here or in Euskal Herria? There are many to think of, all the miles he drove just to be at each of our special days. He is always so uplifting, energetic, and pleasant to be around. Mike was born in Busturia, Bizkaia, in 1923 and came to the U.S. in 1948, after completing military service in Africa. He started out as a sheepherder in Yakima Washington, and after pursuing different job interests in various western states, he finally ended up in Winnemucca where he purchased the Winnemucca Hotel with his partner, Claudio Aguirre in 1963. According to Mike it was his idea to buy the hotel, "so we bought it having never sold a "high-ball" before, not even whiskey." In 1971, he bought his partner out and continues to be the sole owner today. Mike Olano has been a member of the Euskaldunak Danak Bat Basque Club for over 40 years, serving in several capacities: 8 Years as Club President, 8 Years as Vice-President. Mike was a NABO delegate for 25 years, just recently stepping down due to health reasons. Mike was the first person to incorporate wood chopping and weight lifting in the Winnemucca Festival. One of Mike's proudest moments was serving as Parade Marshal at the Winnemucca Festival. Since arriving in Winnemucca in 1963, Mike has been the "Good Will Ambassador" for Euskaldunak Danak Bat Basque Club and the entire Basque Community in Norhern Nevada. Commissioned a 2nd Lt. upon graduation from UNR in 1966, served in US Army Infentry in Alaska, Vietnam and Olkahoma, decorations among others are: Silver Star, Bronze Star, Vietnamese Cross of Gallentry and the Combat Infantry Badge. Separated service in 1970, as a Captain, returned to live in Reno with wife Cheryl and three boys; Timothy Paul, Patrick Mateo and Dominic Jon. Moved to Elko in 1973 and finally connected with an organized Basque community through the Elko Basque Club. All my sons did the Basque Dancing and the NABO Music Camps, all speak some Spanish and one is fluent in Basque. None of these things were around when I was growing up and no Basque was spoken in my home except with some visitiors. I am the proud Aitxitxe of 7 grand children. Moved to Elko in 1973, worked 28 years at the Nevada Youth training Center as a teacher of Social Studies, move to the Elko County School District in 2001 where I remain as a teacher of the Alternative School for the district, grades 6-11, sort of a "one-room" school for students "at-risk". Have been an active member of the Elko Basque Club since 1973, served as President for 7 years and on the Board of Directors and NABO Delegate for most of the years between, I served as NABO President for 7 years and for the past three have been an active Vice-President. 1993-1995...Consulant to the project "Amerikanuak! Basques in the High Desert"
2000............To Chicago as for the design awards for "Bilbao, the Transformation of a City"
Nací en Barcelona el año 1.948, de familia basca nacidos en Bilbao. Estoy casado con Rosa María,Fernández Pando ( 1.980 ), a la que conoceis algunos de vosotros y tengo dos hijos Aitor ( 21 ) y Asier ( 16 ). Actualmente tengo mi estudio como arquitecto y trabajo como Arquitecto Tasodor Hipotecario ( Valoración de viviendas para la concesión de créditos ) para BBK ( Bilbao Bizkaia Kutxa ) y para la Caja de Ahorros de Navarra. Me gradué como Arquitecto en la Universidad Politécnica de Madrid ( 1,980 ) y como Profesor de Piano en el Real Conservatorio Superior de Música de Madrid (1.970 ). En 1.971 obtuve el primer premio de composición de Canción Infantil de TVE. Aunque toda mi vida la he desarrollado en Madrid, la educación que recibí de mis padres fué totalmente basca, desarrollando en mí todo al cariño hacia nuestra tierra Euzkadi. El verano de 1.959, mi aita me compró en Bilbao un txistu y con un amigo de la familia, aprendí las primeras lecciones de txistu, que luego continué estudiando con un amigo de Madrid, Juan Jose Ugalde, de Gazteiz, que vivía en Madrid. Actualmente, seguimos tocando el txistu juntos en todas las ocasiones en que se nos llama para celebraciones en multitud de sitios, así como en radio, cine y televisión. Durante los veranos, en los años 60 y 70, recorría Euzkadi, con los txistularis de Bilibao, y tocando en todos los alardes de tixtularis que se hacían por los pueblos con motivo de las fiestas patronales. Soy socio fundador de la Sociedad "Euzkal Etxea " de Madrid, que nació como unión de todas las personas bascas que residíamos en Madrid, actuando como organista en la Misa de los Domingos así como tocando el txistu en todas las ocasiones en que se me llamaba. Dimos una gira de conciertos, contratados por Radio Nacional con Kepa Junkera, por Holanda el año de 1.989. Actualmente pertenezco, desde 1.984, año de su fundación, a un coro profesional dedicado a la investigación e interpretación del Canto Gregoriano, "Schola Antiqua", habiendo realizado varias grabaciones y dando conciertos por Europa y EEUU. En esta asociación ( Euzkal Etxea ), conocí a Sabin Olaskoaga, contante del grupo "Los XEY", con el cual en muchas ocasiones hemos tocado el txistu y el acordeón conjuntamente. Su hija Anetxu, tuvo conocimiento en 1.979 de la muerte de Jon Oñatibia y recurrió a su padre para que buscase un txistulari par el Music Camp de ese año en San Francisco. Cuando a mí me llamó Sabin, estaba en Israel y en Grecia en una gira de conciertos corales, con una coral de canto polifónico, de la que yo era el director. Con la primera persona que yo hablé fué con Pier Etxarren y cuando me preguntó como nos reconoceríamos en el aeropuerto al llegar, le dije : Iré con Txapela, que es la cédula de identificación de un basco. No hubo ningún problema de identificación. Posteriormente seguí asistienda a Music Camp en diferentes lugares : Fresno, Boise (varios veces ) Chino, Salt Lake City, Winnemuca, Backersfield, etc. hasta el año de 1.996 en que viajé a Music Camp por última vez. Recuerdos de Music Camp: De todos los Music Camp, guardo un maravilloso recuerdo, ( partidas de mus, las clases, fiestas, picnics, bailes de musumé ) y sobre todo de las personas con las que tuve contacto y de todos los chavales, los cuales creo que algunos se acuerdarán de mí. Familias como : Elu, Etxarren, Inda, Anacabe (Franzoia), Beristain, Campos, Eiguren, Yzurza, Jausoro, Anes Mendiola, Pedeflous, Goitiandía, Iribarren, Achurra, Sangroniz, Miller, Donahue (Megan ), Bidaurreta, Cendagorta, Better, Grupo Oinkari y otros muchos. Seguro que me olvido de alguna y pido perdón por el olvido. Este es el mejor recuerdo que tengo de Music Camp, la amistad y el cariño con el que me recibisteis y me acogisteis en vuestras casas y que para mí han sido una de las experiencias mejores que he tenido en mi vida. Martxel Tillous was born in 1934 in the Basque town of Eskiula in Xiberoa. Following his calling he entered the priesthood and began work as a missionary for 26 years in Africa . Returning to Europe he served four years as the Basque chaplain for the Basque community of Paris from where he came to the United States to serve as chaplain of Basque-Americans since 1994. Aita Martxel is continuing in the footsteps of earlier Basque chaplains, and he continues to fulfill an important role in our Basque-American community. His ministry as chaplain to the Basques of the United States has him criss-crossing the country averaging 60,000 miles a year! He spends 200 nights a year sleeping in his van—with the license plate "Pottoka"—as he travels from his base in San Francisco , California to the scattered Basque communities of eleven states of the American West. All of this to serve the spiritual needs of Basque-Americans—from celebrating mass in the Basque language to baptizing, marrying Basque couples and consoling us at funerals. Our chaplain from Zuberoa is being recognized for both his spiritual and cultural contributions. An avid txistulari, Aita Martxel is often seen and heard playing this ancient Basque flute (or its variation the xirula). Since being here, he has served as the txistu instructor at NABOs annual Udaleku-Music Camp (Basque Cultural Summer Camp) for youth. After a Basque picnic meal he is always there to join in a sing-along or to help encourage the formation of new Basque cultural venture. He also started a newsletter ("Lokarria") that goes out to thousands of Basque-American families and thus further assisting efforts to bring our community closer together. NABO salutes Aita Martxel's self-less dedication to his tasks and we consider ourselves fortunate to have been blessed with his presence among us. Zorionak eta esker mila Aita Martxel! Al Erguiaga was born in Boise , Idaho in 1935 to Tomás Erquiaga and Anita Echevarria. He grew up immersed in the Basque community, where he learned to celebrate the culture and heritage around him. When they were children on the family's farm in Meridian , his father taught Al and his sister, Alice, to dance by singing and clapping for them. When he was old enough for Basque dancing lessons, his father enrolled him in Juanita "Jay" Hormaechea's class. It took a while for Albert to feel comfortable dancing in the class, but he came to love Basque dancing after performing at several music festivals and other events. Al went on to become a founding member of the Boise Oinkari Basque Dancers in 1960. It soon became apparent that this was a man who not only dreamed big Basque visions but worked to make these dreams come true. He went on to become a founding member of the Boise Bihotzetik choir, the originator of the first Jaialdi festival and first president of NABO. What has this man not done is the question when it comes to the promotion of Basque culture. His efforts transformed the Boise Basque community. Today the Oinkari are synonymous with the city and the state; Jaialdi is the single largest Basque event in the nation and one of the largest outside of the Basque country itself. The Bihoztik choir continues its proud tradition of Basque song and Al is always there lending support and his fine voice. Al has certainly helped to positively transform the Boise Basque community, but then his pioneering efforts to create NABO also mark him as a man of broader vision as well; his efforts consolidated the creation of our national Basque club federation in 1973 that today serves as the reason we have all gathered together to celebrate. NABO salutes Al for his vision and work to build places where we can come together to share and celebrate our Basque heritage. Zorionak eta eskerrik asko Alberto!